After UFC 228, several discussions came up regarding what kind of Submission it was that Magomedsharipov pulled off against Davis? It’s very simple; it was a knee bar. A better question is why it happened? Especially in MMA when fighters don’t tap unless they’re convinced they’re about to break in half. This incident is an example of one of the three red flags often discussed in the TRUJITSU system. For those unfamiliar, Red Flags are used to evaluate the practicality of a technique working against an actual opponent, beyond just a friendly roll session. If a move has all three red flags it most likely will never work. In the case of Magomedsharipov vs. Davis, a creative knee bar was successfully pulled off that involved one Red flag, and that Red flag was a “Delayed reaction”. Let’s talk about what specifically happened, and what could’ve happened with one minor adjustment. At approximately 3:20 seconds of the second round, Magomedsharipov locked in high back control as Davis’ attempted to stand up. Magomedsharipov maintained a strong hook on Davis’ right leg and reached down for a knee bar. While everyone is discussing the awesome knee bar that took place, the detail that continues to be overlooked is the reason why the knee bar was able to stick in place. This detail involves Davis’ right leg. The picture below explains the delayed reaction that made the difference in this leg attack. Davis’ right leg continues to stay bent. Straightening the right leg would have made Magomedsharipov’s hook less tight, and would have enabled Davis to move his hip to the left, relieving pressure from his leg stretching, and most likely would have allowed him to wiggle out of knee bar. One adjustment can make all the difference, however the more competitive the match, the narrower the window of opportunity is to make the adjustment. A delay in processing can allow opponent to solidify their offense. Long story short, the red flag that made the difference here was a “delayed reaction”. To be continued in detail on the TRUJITSU YouTube channel and the TRUJITSU show. Coming Soon! After a short 6 week break, TRUJITSU representatives jumped back into competition for the Jiu Jitsu World League American Open Championship, however this time the circumstances were different. Summer season is often slower due to extreme heat and seasonal distractions. Various obstacles made it difficult for most veteran TRUJITSU competitors to attend the American Open, however this gave an opportunity for a newer and younger group of TRUJITSU representatives to step up for the challenge. The result was a First Place Academy trophy once again. Thank you to all TRUJITSU representatives that made this happen. Those that stepped out of their comfort zone, (many for the first time), and those that helped their team mates practice the TRUJITSU game plan and concepts. TRUJITSU concepts for the win! Rick Watson of TRUJITSU Bakersfield. Victoria Suarez of TRUJITSU Bakersfield. 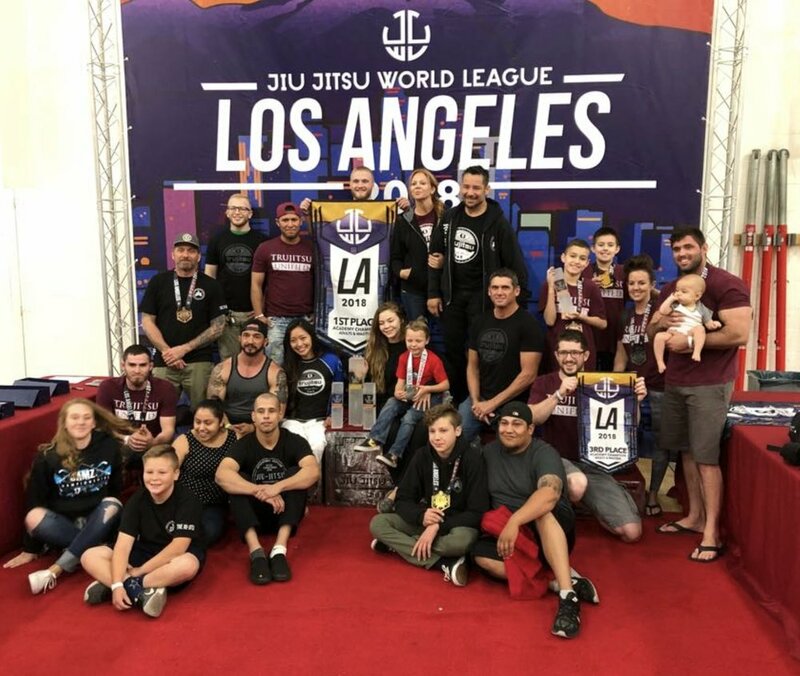 After a good day of competition at the Jiu Jitsu World League Los Angeles, TRUJITSU Unified walks away with 6 trophies. TRUJITSU unified, with a team consisting of members from Bakersfield BJJ, Delano Jiu Jitsu Club, Blacksmith Jiu Jitsu, Outliers Jiu Jitsu, and Bakersfield PAL captured trophies in every category for both Youth and Adult divisions. Thank you everyone for your hard work and demonstration of TRUJITSU concepts. TRUJITSU Placing at various categories. TRUJITSU Bakersfield and TRUJITSU Blacksmith Win Academy Trophies. Outliers Jiu Jitsu wins the Elite 8. Thank you to these Champions and Finalists for their effort and work. Congratulations! What Happens when you have a few devoted coaches working together with an absolute interest in the development and success of their students. 3 strait championships in a row! That’s what happens. Congratulations to TRUJITSU representatives Outliers Jiu Jitsu from San Diego California. Outliers Jiu Jitsu once again captured the Youth Elite 8 1st place trophy at Jiu Jitsu World League Champions Cup OC. Learn the Concepts, Excel in the game. TRUJITSU reaches IBJJF top Ranking spot. Matt Baker wins Double Gold At San Jose open. Always Remember: A mount is an upside down Closed Guard. Why do I lose control of my opponent as soon as I try to attack from a mount?! If you find yourself asking this question, you’re not alone. Even though the mount is considered one of the more dominant positions, there are challenges when trying to attack your opponent. And the other common approach involves attacking your opponents arms which requires a transfer from a straight linear top position to perpendicular top position. The only exception to this is an Americana/paintbrush that is easy to see from a mile away. Both processes of attacking provide a window of opportunity for the your opponent to escape because you are ether committing your arms or shifting your weight off of your opponent when you transition. So what is the best solution for attacking when you have a Mount? To successfully attack without creating a window of opportunity for your opponent to escape you must implement two factors. The first factor is to keep constant pressure. The second factor is you create an angle. You wouldn’t want your legs loose in a closed guard, so think the same when you are holding a mount position..
Keeping constant pressure on your opponent prevents quick explosive movements, which is very important when going against an athletically gifted opponent. They may be able to move and bridge, but if you are putting pressure on them, you will be able to slow down their explosive movement to a pace that you can process and if necessary adjust your body to maintain a top position. The other key principle is creating an angle to stabilize and attack. An angle creates two advantages. The most important one is it gives you a better ability to post and bass out, which makes it almost impossible for your opponent to bump you from side to side. The more they unsuccessfully try to bump, the more they become exhausted and careless with their arms. The attack opportunities become easier and easier as your opponent gets frustrated trying to escape. The other advantage is that having an angle gives you a quicker opportunity to attack by either positioning to a hurdle mount or slipping around to take the back. The illustration below shows the exact body positioning needed for an airtight mount game. For more information on this subject, video clips can’t be found on TRUJITSUs YouTube channel. When Both arms captured and your weight is high on your opponents torso you can choose to transition to Hurdle mount, or slide to back control. Ok as promised, back to solving foot lock attacks, part 2. Hide your Feet, Hide your Legs. Ok, once again imagine yourself getting ready to roll with an opponent that you know enjoys twisting legs and breaking Ankles. What do you do? Here's a great idea? Pull Guard and play spider guard... ok just kidding. That would be horrible. Actually every guard that involves your legs being upright and protruding forward is pretty much a bad idea against a leg lock enthusiast. What guards should you play if you are on bottom?? Guards that hide your feet or allow you to hug your opponent's hips or torso. For example Sitting Guard or Quarter Guard. However a common approach being used to attack the legs and feet is actually to catch the leg from a Guard position by using a hook to pull the leg or foot away from the body. That's why TRUJITSU rule #10 is important. As discussed previously, Always keep your knees in front of your feet when facing a leg attacker. It's very simple, keep your feet behind your knee so it's harder for your opponent to reach your feet. In addition to not letting your opponent grab your feet, don't let your opponent elevate and lift you or get under your base. This is another scenario that often happens when your opponent is playing X Guard. The Guard player lifts up the top player, scoops his leg, and then starts to attack the leg as he pushes the top players body away. Words don't explain well, so once again please see the pictures bellow to better illustrate. The beginning of a problem. the left leg is forward and the foot is close enough to hook. The Guard player collects the Leg. The Guard player pushes legs apart and begins foot lock. The foot is now caught! This is another example of what not to do. *Please see illustration below on what to do to if your opponent hooks your Leg. If your opponent grabs your leg, first drop your weight. Lock your feet together, and follow the next few steps to pass the Guard. Underhook the head and push your hips forward. Turn your body to face your opponent with your feet and legs still wrapped around your opponent's leg, then hug the top leg. Don't just survive their leg attack, use their attack to pass the Guard. Leandro Lo vs Nick Meregali, So what really happened?. Leandro Lo vs Nick Meregali. So What really happened? The 2017 Worlds is over and a lot of great matches took place. A few upsets, a few goofy calls, and as always a few lessons to take back to the classroom. One of the matches to make a wave was the battle between Lo and Meregali. Lo was expected to win, however Metegali pulled off an upset victory. By all accounts Lo should have won, having the edge with much more experience, confidence having beaten Meregali before. Moreover, Lo is considered one of the best conditioned Jiu Jitsu athletes, and some might say he was a tad bigger then Meregali. Just a tad. So what happened? Very simple, A "Reach under" sweep is what happened! Why I am I writing about this? Because this is an example of a "TRU" technique. A TRU technique is a move that once you catch your opponent in that move, that's it, they are stuck, and you are going win that transition regardless of how athletic or strong they are. Those that have been following the TRUJITSU revolution from the beginning probably recognized the "reach under grip" as it took place and aren't too surprised by the outcome. It's simply that difficult to get out, unless you are Superman and you can fly. Jiu Jitsu constantly evolves, however the concept of grabbing the bottom of your opponent's Lapel isn't new. There are several Guard games that involve creative ways of grabbing your opponent's Lapel. Lapel guard, Worm Guard, and for those that have been following TRUJITSU from the early days you're most likely familiar with the Jiu Jitsu lab DVD series that came out almost 5 years ago and introduced Lapel concepts from the Sitting Guard. However the outcomes aren't always the same or as definitive. It would be easy to make a 20 page lesson on this subject, and why some grips are better then others. But the point of these blogs is to be brief and still informative. So the best compromise is to say..
1. First, look at the picture below. 2. Ask, How was Lo trying to respond ? 3. Why did Lo feel he could stand up ? If you analyze those 3 hints it will probably become more clear why the "Reach under grip" works so well. Ok, What really happened between Shaolin vs Florian? Ok we are right in the middle of discussing how to stop Leg Locks, but this last weekend's match between Florian and Shaolin keeps popping up, so I figured it might be a good idea to bring up a couple of valuable points. It's not too often I talk about fights or matches, however several comments and questions keep surfacing about this fight. Just Minutes after the fight took place I had students asking if I saw the fight. The answer was no, and I wasn't in a hurry to watch because I figured it was just another case of someone winning and someone losing with both sides having fans emotionally invested. What makes this interesting is that most of the comments on the news feeds are just referencing "The Choke", when there was much more that happened that lead up to the choke happening. First it should be said that Kenny Florian is a good and knowledgeable Jiu Jitsu competitor. Moreover, he recently has done well in competition. I have never rolled with Kenny personally, but I do recall seeing some of his seminar material floating around on a bootleg DVD about 10 years ago that showed he had a solid well thought approach to Jiu Jitsu. High level Jiu Jitsu, that's what happened. Never forget anything can happen in High Level competition. There are details to be explained of course, but the simple answer is, "High Level Jiu Jitsu", where one mistake can set the tone for a bad outcome. Especially if the match has a time limit, which we will also bring up. I will go out on a limb and say if both of these competitors fought again, the outcome might be a bit different, if not, at least it would be a closer fight. Both of these competitors are talented and deserve respect. Those of you that get to hear my rants on a regular basis already probably recognized a certain detail at the beginning of the match. Florian was trying to lead with his hips and stay out of the range of Shaolin's guard. This is becoming more common and my prediction was that this would be a standard practice to stay out of range of your opponent's guard. Sitting guard is what happened next! Now before you think I am going to spin this discussion in to "Why you must learn sitting guard," I want to remind everyone that Sitting Guard also has its down side or "kink in the armor." The only hint I am going to give you on that is to look at the last frame of the exchange shown below. However, where Sitting Guard does benefit is from the Fulcrum or pivot point you create with your knee. The knee creates the sweep not the foot hook. Notice where Shaolin inserts foot to position knee against Kenny's torso. Shaolin executed the sweep with an overhooked arm which probably made the sweep easy to underestimate. Usually the overhook allows the top player to pass by creating an angle, however in this case the fulcrum created by the knee is the variable that changes everything. The images below show the progression of the sweep. When discussing this match, this first exchange set the tone for what would happen next. Of course we know the match ended with a clock choke, however that choke may not have ever happened if Florian didn't feel the pressure to catch up on points or attempt a sweep that wasn't ripe yet. The other key was Shaolin's continuous grip on Florian's pant leg that limited options from The De La Riva guard. Why did Florian keep an open guard? Because he probably felt the need to create movement because he was behind on points. then came the clock choke. Those that compete have probably recalled the feeling of being in Florian's situation. In competition a rough start can create a ripple effect. So much can be taken from this match. Not just the conclusion. If you ever watch a high level match and wonder why both competitors are so cautious, this match is a good example of why. The difference between Butterfly and Sitting Guard is the placement of your knee against your opponent's torso. A few observations to take note, that will probably seem familiar to those already following TRUJITSU. 1. The Sitting Guard is easy to underestimate. 2. t's never good to be behind on points in a short match. 3. Don't allow your opponent to control your pant leg when your guard is open. for those that have asked my thoughts, hope to his helps. Now let's get back to the Leg lock stuff. In honor of PANs, let's see how often this pass is needed. Don't Get out of line!
" Don't get out of line! " That statement almost everyone hears growing up, believe it or not, is a great reference for Jiu Jitsu defense. Remembering that quote can be what saves you from some of the most common submissions and bad positions your opponent may put you in. Remember the TRUJITSU rule "more important than learning any 1 move, is learning the proper way to move". TRUJITSU is the scientific breakdown of Jiu Jitsu as a language, and this detail is for conversing your way out of bad positions. When you look at the function of common submissions such as the Bow and Arrow and arm bar, the effectiveness of those attacks is almost completely dependent on the body alignment of both players being perpendicular. Keeping it simple, when your opponent attacks, immediately line up your body in a parallel position with legs pointing the same direction and life gets easier. This concept is simple and in some cases you may find yourself falling into this movement by coincidence when scrambling. However if you find yourself trapped under your opponent, paralleling your body should be your immediate interest. To better illustrate, please see pictures below. of a couple common scenarios. 1. When your opponent attacks your arm from side control. Note: step 1 Body position is crossed. Step 3 shows feet pointed in same direction. 2. When you are trapped in your opponent's side control. Once hips are parallel, the opportunity to reverse top player becomes easier. Long Story Short, stay in Line when trapped under your opponent. Unless you are playing guard, the more perpinndicular you are, the easy it is to control you. or be like the Koala and sit? For those of you that already have noticed the spelling error for Pray Mantis, thank you. Now that I have your attention, let's talk about one of the most underrated Guards in the Jiu Jitsu Kingdom. The Koala Guard. If you are wondering why this Guard is called Koala, look at the picture and note the similarities. This position often develops from sitting guard when your opponent decides to stand up. However there are several ways to initiate this position. And once you do, the possibilities are almost endless because your back is off the mat and you have gravity on your side to create momentum. What people often overlook is how this position can take you to several other guards with literally 1 or 2 steps. That's if you even need to, considering you probably will find easier options to knock over your opponent from Koala Guard. Need a few examples? Please look below to better explain and demonstrate the perks of the Koala Guard. Here is an example of how to get to Koala Guard from De Lariva Guard. As Ben pushes down on Ian's leg the transition begins. Single Leg take down From Koala. This option works with or without grabbing their arm. However grabbing their sleeve provides several counter options. Sit up when your guard is compromised. The options are endless. Never doubt the strength of "The Koala". Need more info? always remember to tune in to TRUJITSU on Periscope. The higher you climb up a ladder? The smaller the steps become. Small moves become very important to "get right".